Awakening to your true authentic self requires more than simply using the five senses of sight with the eyes, listening with the ears, feeling with the skin, smelling with the nose or tasting with the tongue. These basic senses help us learn about our immediate environment as we grow up from babies into adults, but we need more to fully awaken to our true inner selves. 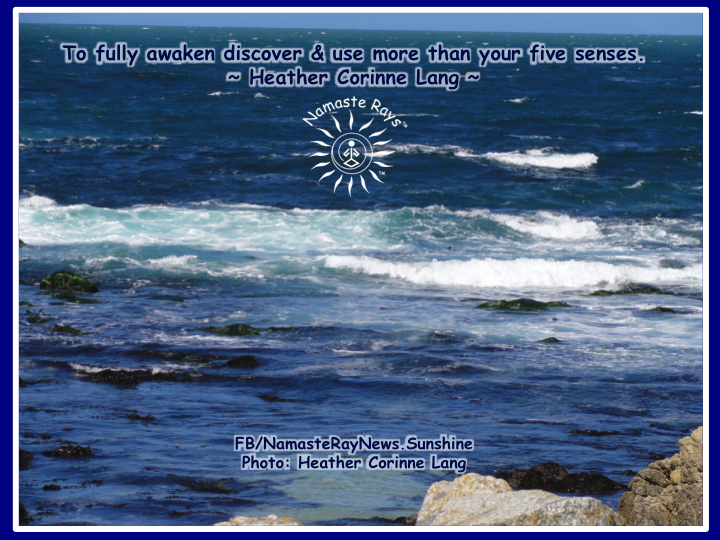 To fully awaken discover & use more than your five senses. However, using other senses which we all have access to, will help you gain wisdom and thus work towards your own awakening. This involves healing ourselves either by ourself, or with others who can help us unlock what we need to heal and unlock our other senses. Some may call these other senses intuition or clair abilities. Accessing these is learning how to see or listen with your heart, or hear in your mind or touch with your energy. Any of these may be something you have experienced before. For instance, “knowing” someone is about to call you right before your phone rings. You felt their energy…their thought energy…before you heard the phone ring. Or perhaps you heard the phone ring and looked and it hadn’t, but then a moment later it rings. Another example is knowing how someone feels by feeling it with your heart. Maybe you were gazing somewhere and could have sworn you saw a sign, but when you looked again it wasn’t there, but you know you saw it and you did. You saw it with your mind, not necessarily your eyes. When you have these types of experiences, you can contemplate them further. You can strengthen them by being open to these types of experiences. Being open to them means being mindful of the occurrences. Noting them or discussing them with someone else can be very helpful, too. The more open and mindful you are to these occurrences, the more they will be more conscious to you. Then, you can use them to think upon what they mean to you. Like using others as a mirror to healing (see my last post), we can use these other senses to heal ourselves. It is through this healing that we awaken to our true inner Divine Light Self, our higher self. Many times it’s our higher self that is giving us these messages to help ourselves heal and awaken. Sometimes it’s our Spirit Guide or Animal Totem or Guardian Angel or another. But, it’s all for our own growth and healing. It’s also important to note, awakening is a process. You will awaken one part of yourself, to discover another. You will heal one part, to discover another part which needs to be healed, and so forth. Be patient with yourself. And remember, you are here to learn & grow…and the more you do, the more you awaken! May you discover your other senses and use them to heal and awaken! Thank you, Tammy!! Appreciate you!